It’s so easy to become overwhelmed by issues like sleep struggles, clinging infants, and potty training, and yet our life is so much fuller and brighter and bigger than these (not inconsequential) hurdles. Yesterday I basked in Linnea’s shrieking laughter as she crawled after the big kids in our childcare swap. Tonight after I got home late from a church meeting, Darwin was so full of joy to see me. We all wandered into the backyard in the evening light. Linnea ate kale flowers and watched the mourning dove fly through a hawthorn and Oregon ash thicket. Darwin ran around the yard yelling “MamaRae watch this!” After Leah took Linnea in to nurse, Darwin helped me clear some weeds from around our garden boxes. The air is full of spring promises right now. In this moment, I’m laying in news next to a sleeping two year old. A quiet lullaby is playing on the sound machine. The wash is filling and spinning in the laundry closet. These are the sounds of home that center me. I am grateful for this moment. Our sweet little Bee is nine months old! Linnea has now been out longer than in, and is growing into herself faster each day. She crawls, pulls herself onto her knees (and balances like that) with ease. She says ‘mama’, ‘GaGar’ (DarDar), “kaah” (cat), and ‘gog’ (dog). She’ll eat anything you offer her at least once, and rarely refuses things after a first taste. Linnea started out none months in a horrid mood that we have been blaming on suspicion of ear infection brought on by a cold. Without a fever, and with an improved attitude, we’re taking a watch and see mentality, since we don’t want to use antibiotics unless there’s a real need and benefit expected. Happy baby returned today though. She spent much of the afternoon (I got to work from our friend’s house while she had the kids) crawling after the big kids, shrieking with laughter. She’s into everything now, with a particular affinity for cords and paper, and she’s so fast you wouldn’t believe it! This month I started doing bedtimes with Linnea, much to her dismay it seems. Some nights involve 45 minutes of inconsolable screaming, and others she’s out in a few minutes. I’m sure there is some difference between nights, but I’ve yet to figure it out. For now I’ll pick up ear plugs! Nothing like sitting in the sun. 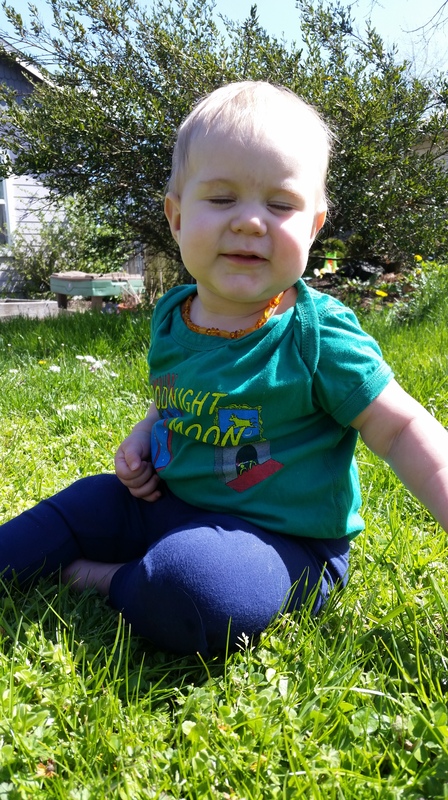 Linnea LOVES to be outside. I think she would live in the backyard if we would let her. Leah and I have been very deliberate in teaching the girls about the importance of consent. Other than health and safety concerns from specific people (mamas, grandparents, other care givers) their bodies are theirs to allow others to touch or not. They get to decide if they will allow someone to hug them, high five them, or provide any other contact. They also must respect that others can choose the same. Darwin may want to hug a friend, but must ask first, for example. As you might expect, this is a long game kind of teaching. We’ve been working on it (both with her and those she interacts with on her behalf) for over two years. This week, we began to see the fruits of this labor. I have rarely been prouder in my life. Now we get to see if she enforces her bodily autonomy outside of the mamas. Our toddler is becoming her own little person who can stand up for herself. This week has been rough, but that made everything else worth it. Thank you all for your thoughts and encouragement about sleep! Last night Linnea was able to fall asleep with me after 40 minutes (an improvement of 5 minutes on the screaming and not having to have Leah step in! ), and Darwin was asleep by 9:15. A full 45 minutes earlier. Now, one data point does not a trend make, but here’s what we did. First, no screens in the bedroom, even for mamas. Screen addiction is a real thing, and I’m hopeful that more focus on the kiddos will help them feel more secure and safe to fall asleep. Plus screens disrupt melatonin production! The one hitch is that we don’t have a clock in our bedroom, which makes me feel nuts. So today, I’m picking up a new clock. Second, I’ve taken over bedtime with Linnea and Leah with Darwin. I’d been nursing Darwin in the bedroom and when I would leave it would trigger 45 minutes of upset. So I nursed her in the living room, and she went and did her stories in the bedroom with Leah. All told it took her an hour from the time she left the living room to fall asleep, but the real metric here is the 9:15 sleep time. That tells me this may actually help. If we’re not seeing more improvement in a week, I’m going to talk to our pediatrician about melatonin. Here’s hoping we can just knock this sleep thing out! About a week ago I started doing bedtime with Linnea and some nights Leah would with Darwin. Darwin does not go to sleep before 10. She is currently awake. Or was when I started this. Any advice on magic that moves a kid’s fall asleep time up is welcome (we’ve tried cutting naps – miserable and can’t go on the car after 3, falls asleep in under 2 minutes, moving bedtime up – 7 pm bedtime can lead to a 9:15 sleep time…but not consistently, and letting her choose to go to bed when she gets sleepy – around 9:30 for a 10 pm fall asleep). We swapped in the hopes that by not nursing Linnea to sleep at night, she would start to learn how to fall asleep more easily and we wouldn’t have a repeat of the Darwin bedtime fiasco. The first few nights went pretty well, but last night was 45 minutes of The Scream. I think I blocked out how hard 9 months was with Darwin and am currently having real life flashbacks. Currently the slightest thing will set Linnea into a banshee scream fest that could cause glass to explode. During the day, if she doesn’t get a mama when she wants one, including in the car, she screams. This is not an exaggeration. She screams like someone is murdering her. I reminded Leah tonight that it was around this age for Darwin that she turned to me and said she wanted to start trying to get pregnant when Darwin was 11 or 12 months old. She looked like she might throw up. It’s true that she is bearing the brunt of this 9 month old terror (we’re currently hoping secretly that she has an ear infection or something. ANYTHING. That could be a realistic quick fix. I suspect it is developmental though. Why, ever, would one want more children? Today this happened. We just hired a nanny (heretofore “V”) for 11.5 hours a week. Just like that our schedules became manageable and our bank account a little bit lighter. Darwin woke up about 5 minutes before V got here, and was her usual quiet self. For about five minutes. She was so comfortable that she started talking all about our animals and her mamas and her sister. It was great. And V managed to slip into the conversation that she has a gay brother who his married with a little girl. The level of stress in our household just plummeted for mamas. Hopefully this will also be a fun development for the girls! Now that Linnea is fully mobile, I’m working full time (except this week, because a cold is trying to ruin my life), Leah is full-on in her PhD program, we just don’t have enough time in the day anymore (as if we ever had, but now we’re at the point where work is suffering noticeably). Linnea has also aged/sized out of our lovely friend J’s care (she has cared for both girls in their early months, we are so full of gratitude to have her in our lives). We have been in a childcare swap for anywhere from 10 to 20 hours a week for the last year and a half, and it has been wonderful, but we’re at the point where we just don’t have enough time to trade. Leah is carrying the load of two remaining days a week, but we are short about 15 hours a week for care. Next fall, Darwin will be old enough to attend a preschool, and we’ll either have her at the Montessori down the street, or at another local place about 10 minutes from our house, and on our way to work. That doesn’t solve our issues entirely, but hopefully she’ll enjoy having some time in a preschool environment. Initially, we were planning to do a nanny share with another family who have a child just three months younger than Darwin, but they live 20 minutes from us, and it would do nothing to relieve our time pressures when considering nearly two hours of driving every day (there, to work, then there and home again). Not to mention the full tank of gas we use just to get the childcare every week, and wear and tear on our only car. And part of the reason we are running into a wall with the 4 days of swap is that we spend 2 hours a day in the car, and no time at home. Our dog is lonely. Our house falls apart by Thursday. Having a nanny three half-days a week will mean our dog is not alone and we aren’t spending all our free time in the car so we have time to play with the kids outside before/after dinner, AND we (let’s be honest, I, the one who works during the day and not at night anymore!) will have time to keep the house in some kind of order. So we have joined those of you who have searched for that illusive fit of the perfect nanny. My work provides free access to care.com and we may have found someone already. She fits all our basic criteria, such as having spent time caring for multiple children – including infants – and having her own transportation (the nanny situation we were trying in September fell apart in part because of a transportation issue, part because of a health issue, and part because of a phone-use issue) and sounded amenable to both the hours we need and the pay we are able to provide. Plus, she taught gymnastics for years where Darwin now is enthralled with gymnastics. I’m not expecting her to teach Darwin gymnastics at our house, but at least I know she’ll be up for hearing Darwin beg to go to class every week, all week long! So please, please cross your fingers that tomorrow we’ll be able to hire someone we can feel good about adding to our girls’ list of safe grownups, and regain some of our sanity and quality of work.